The end result is that I still have a profit. And yet I feel crap. And my mind starts beating me up for not doing better. All part of being human, I guess. But not ideal if you wish to be an effective trader. 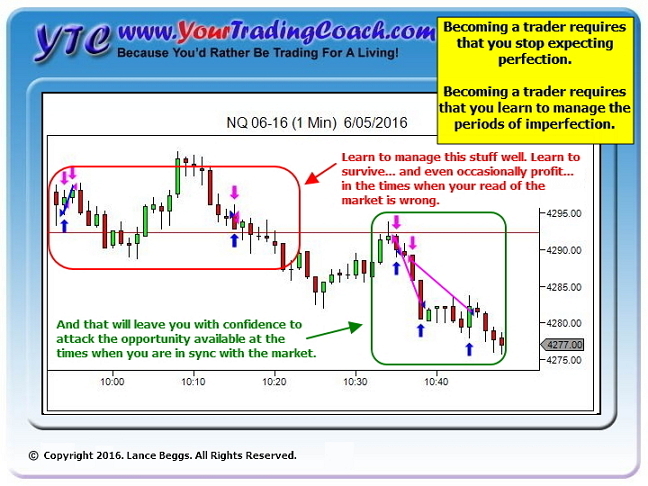 There is very little to be gained by carrying negativity into the rest of the trading session. FIND A POSITIVE. ANY POSITIVE. Break the cycle of negativity as soon as you can. Actively, consciously, seek out and focus on something positive. Here's one I use in situations like the above trade example, where I've taken some good profits but left a whole lot more on the table. Immediately… look left and find an earlier multiple-trade losing sequence. Does the trade I just took completely cover that multiple-trade loss and still provide profits? If so, that's awesome. Great trade. Move on. 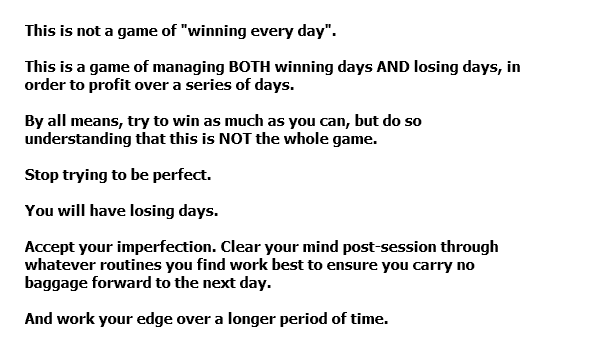 If there isn't an earlier losing sequence, then find something else positive. Anything. Even if it's just something basic like, "There was a time in the past when I wouldn't have caught that at all. I did today. Awesome! Great Trade! Move on!" Whenever you find yourself with some negativity… break the pattern! And consciously declare, "Great trade! Move on!" There are more trades coming and they need your full attention, with a positive and focused mindset. Last week we discussed a common problem with new and developing traders – difficulty accepting losses as a normal part of the game. And we discussed a simple idea for moving beyond this problem, through seeking profits over a larger series of trades rather than any individual trade. Today, let's discuss another exercise which might help. Let's look at your last twenty trade results. It might be something like this. This is the game. 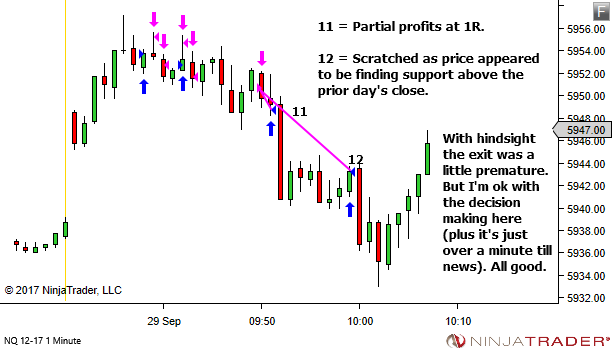 This is how your results will (typically) display over any series of trades. The number of trades on each side will naturally vary. Sometimes you'll have more winners than losers. Other times more losers than winners. But any series of trades will likely include both WINNERS and LOSERS. They're a normal part of the game. The aim then is to approach trading such that anything on the left side (losses) is small enough to easily be covered by one good trade on the right side (wins). Of course… if you end up with excess on the left then this sequence of trades has no edge. And you've got more work to do. But this is the ultimate aim. 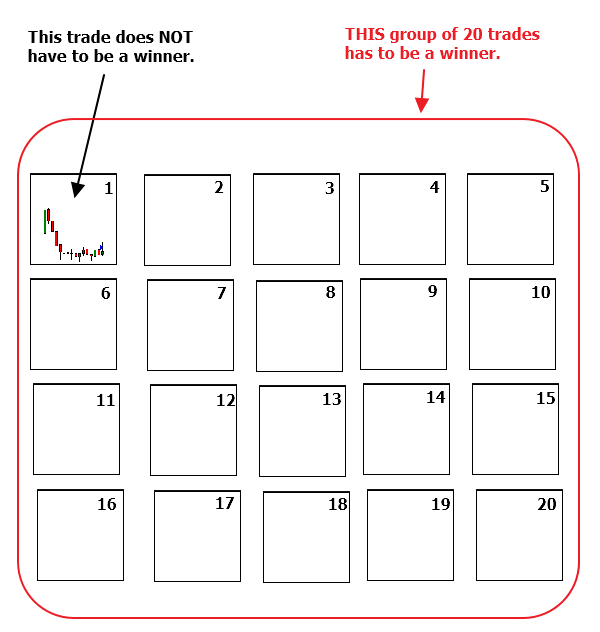 A series of trades which includes both winners AND losers, in which pairing them off leaves you with an excess of winners. Achieve this consistently and YOU'VE GOT EDGE. It might help you to carry out this exercise each weekend, creating a table with your results from the prior week. Firstly to reinforce the fact that it's ABSOLUTELY NORMAL to have both losses and wins. But secondly, to give you a feel for how much of an edge you have. Or how close you are to achieving edge. Or… for some of you… it might help to carry out this exercise live. In real-time. As you trade each day. Add your losses to the losses column. Add your profits to the profits column. And pair them up whenever you can. 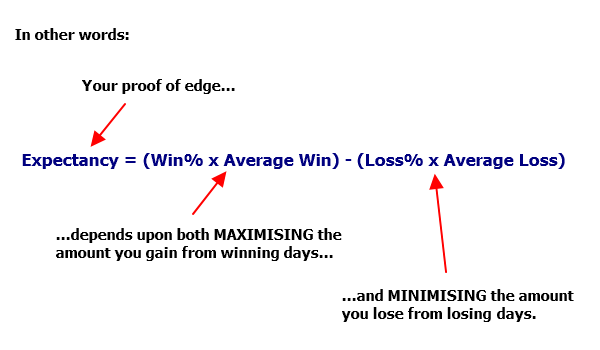 The aim being to keep your losses small enough so that they are easily covered by a single win. And more importantly, achieving a confidence boost when you get a profit on the right side of the table, and have no losses available to pair it with. 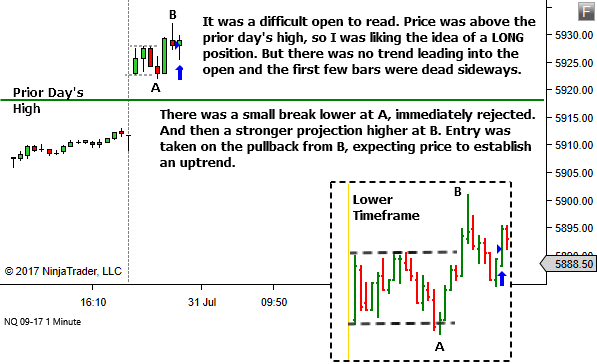 Give it a try if you think it might help you visualise your "series of trades". And hopefully reduce any concern over losing trades. After all, they're just a normal part of the win/loss table and easily covered by pairing up with the next win. They're no problem at all. Take the hit. Focus. And move on. I love this comment in response to last week's article (see the article here if you missed it). Too many traders take the loss personally. As Steve says, they're stuck in the mindset of "Aaargh, I did it again." Their focus is on themselves and their feeling of intense injustice and frustration. Their focus is NOT on the price movement. And so they miss the next opportunity, which spirals them into even greater depths of despair, especially when that opportunity is back in the original direction in which they entered. We've talked quite a bit over the years about the fact that trading is NOT about individual trades. Instead it's a game of profiting over a SERIES of trades. Individual trade results are irrelevant. Series of trades are what matters. And here's the thing – every series of trades will likely contain a combination of both winners AND losers. Take the hit. Refocus yourself. And move on. I shared a simple concept once before, which may help create a shift in mindset for some who read it. Let's repeat the idea today. What if you stopped trying to find winners? 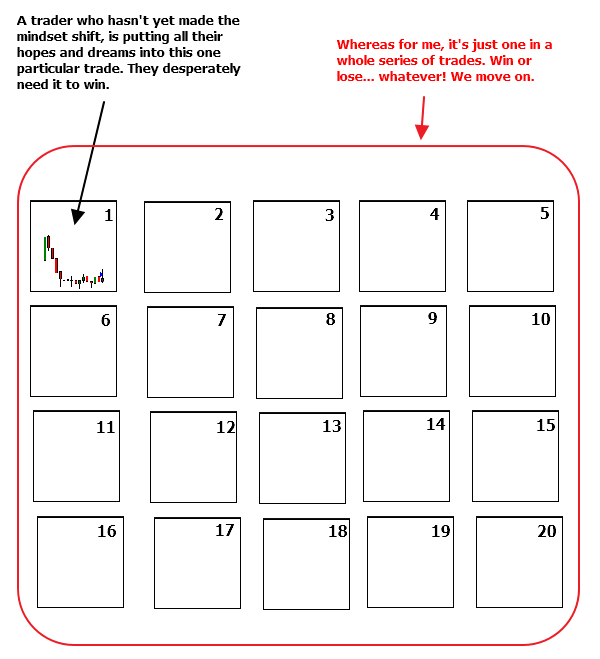 A novice trader is trying to find a trade that will win. I'm trying to find a trade that is worthy of being one in a series of twenty. I don't need a winner. I place all the odds in my favour. And I take the trade. If it's a loss, I take the hit, refocus and move on. It's a slightly different mindset… but one with a whole lot less fear. I want to share one more idea which might help create this shift in mindset. But this article is long enough already. Consider re-entry if the premise remains valid. Sometimes it takes two entries. Sometimes it takes three. There are no ways around this. 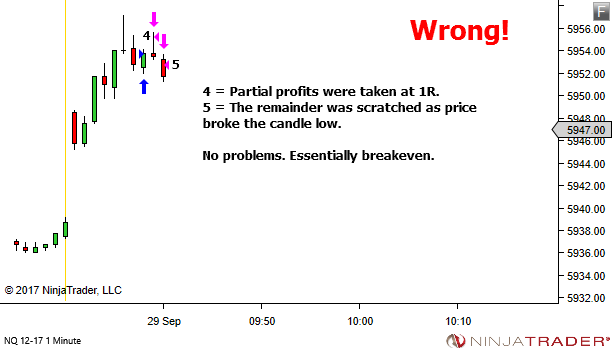 In the uncertainty of market action it's unreasonable to expect that we will always get a perfect entry. So we're left with two options. 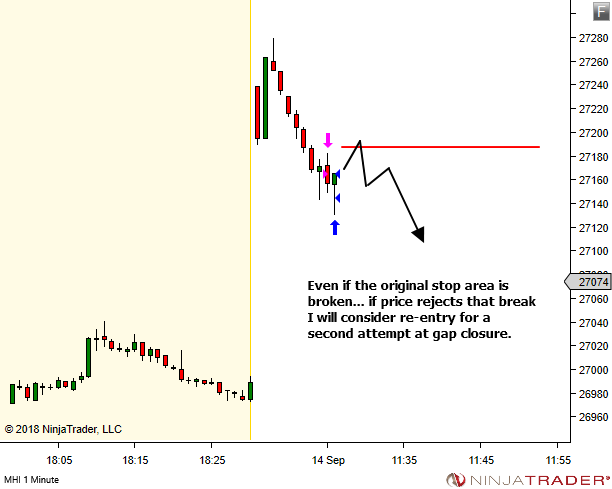 Either we spread the entry via multiple parts across a general entry "area". Or we try for all-in precision but accept the fact that sometimes we'll need two or even three attempts to catch the move. Although I sometimes trade the first method, my preference is for the second. All-in entries, accepting that it may take multiple attempts. 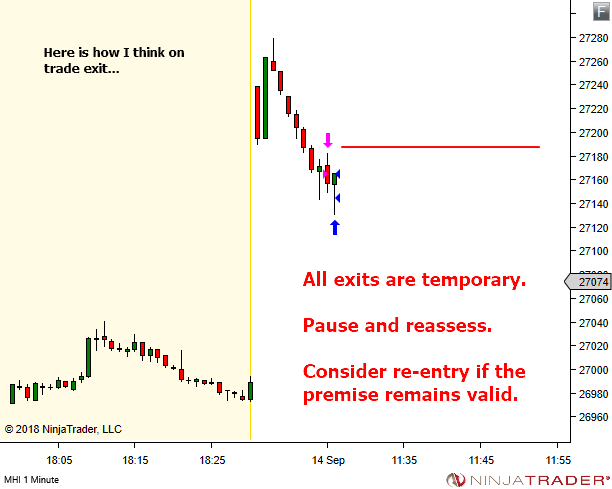 All exits are temporary. Pause and reassess. Consider re-entry if the premise remains valid. 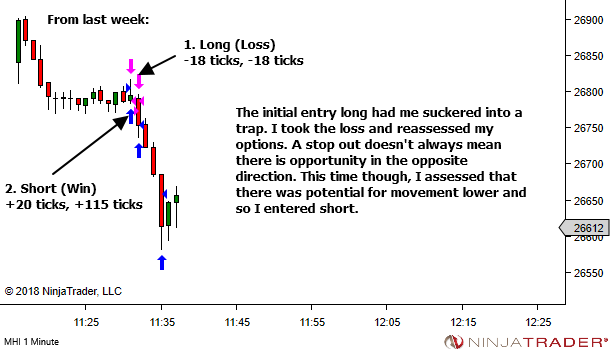 I'm always fascinated to hear from traders who have trouble exiting a trade at the stop loss. The ones who move the stop loss further away to avoid the exit. And then move it further. And further. Until eventually, they can't take the pain any more, so they get out of the trade and destroy several days, weeks or even months of profits. 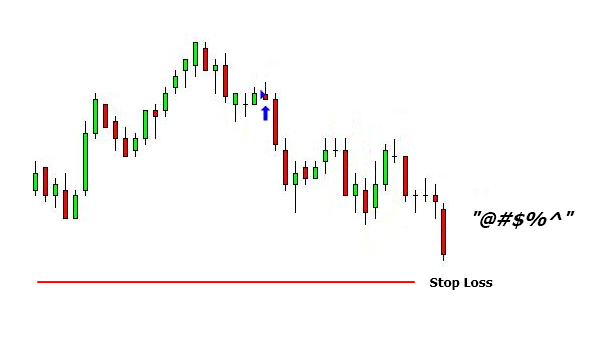 Personally, I don't recall ever holding past the stop, although I have found evidence of having done it once in the past while reviewing old charts. Hopefully this was a one-off occurrence. Either way, I've clearly learnt from that at some point. No-one likes a loss. Me included. But you need to be quite comfortable taking them. 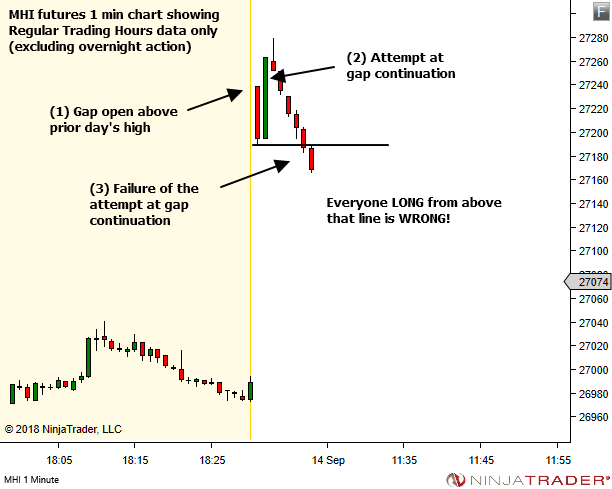 For those of you who have yet to learn how to take a loss, let's discuss what is happening when you hold past the stop. In many cases the primary issue is NOT that you fear losing any money. Often instead, the problem is that you don't want to be wrong. YOU DON'T WANT TO BE WRONG! You rationalise that if you just give it a little more room, and a little more time, price will turn around and prove you right. What does it mean to be wrong? 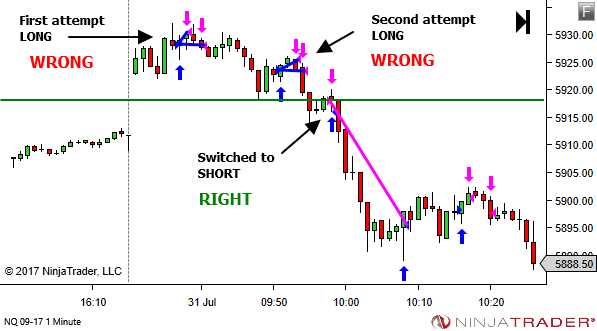 Every trade you get wrong is a dagger in the heart, reminding you of every time you've been painfully wrong in the past. Every time you've failed at something. Every time you fell short of your hopes, dreams and prayers. 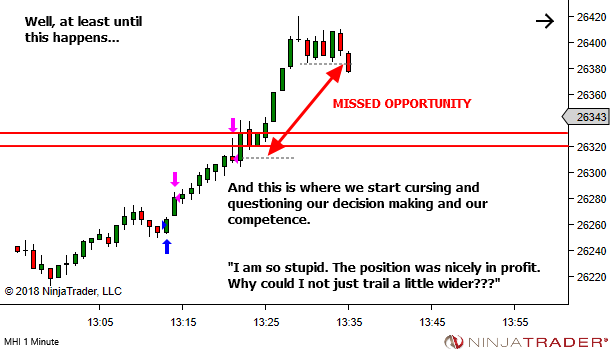 Every wrong trade is one small step closer to the ultimate failure of your trading business. And when you're no longer worthy… what will your family think of you? What will your friends say about you? What will your own mind say about you as you desperately try to fall asleep each night to forget the pain? So you move the stop to give it a little more room. But the fear only increases as price continues to move against you. You give it more room. Again the fear increases. And then again… you give it more room. Until finally… acceptance… you know you're wrong. And now it's about the money. The loss is big, but fear of it getting even bigger lets you get out. Because you KNOW you're wrong. Again, please note that this is not always the only issue. Maybe not always the primary issue. Everyone's situation is somewhat unique. But it is a significant factor in a whole lot of cases. So if you're letting price run through you're stops, give this some consideration. It may just be the pathway you need to explore to find your way to greater success. Here's the problem, as I see it. You're playing the wrong game. You're playing a game of individual trades. But this business is not about individual trades. The outcome of any one trade is irrelevant. 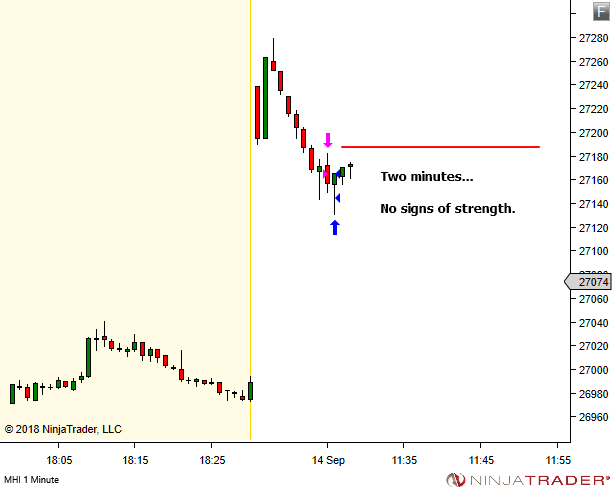 We profit over a series of trades. You need to accept that this game is not one of being right. 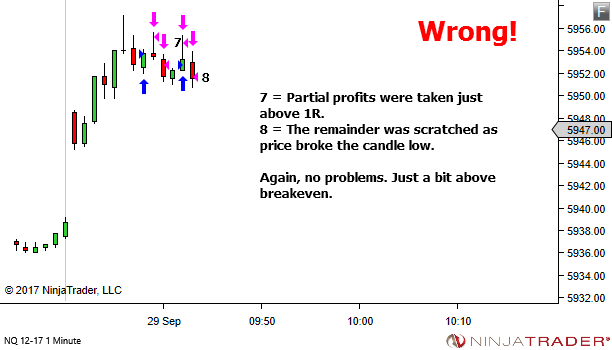 But rather one of managing a sequence of wins and losses so that over a large enough sample we can produce a profit. They're just a part of the game. What if you accepted that half your trades would win and half will lose. And you made it your aim to ensure that over any series of trades (20+) your average win was greater than your average loss? 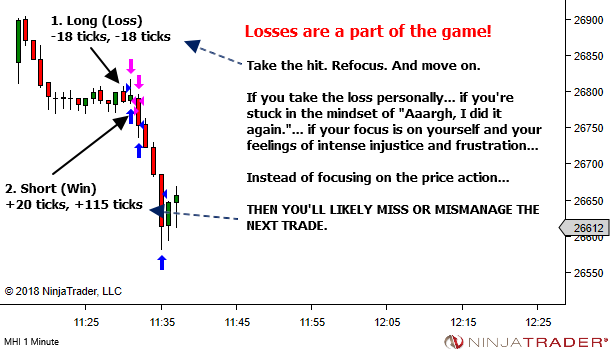 To do this, you absolutely CANNOT let your losses run larger than they need to be. Take your losses, quickly and decisively. Keep them small. It's only one in 20+ trades in your current series. You've got a whole lot of trades still to come. And some of them will more than compensate for the small loss. By all means, aim for as high a win rate as you can achieve. But seriously… a 50% win rate IS enough. Just aim to ensure your average win is greater than your average loss. I received the following message via social media late last year. I am frustrated. Despite all knowledge on stock analysis, momentum indicators, writing journal I make losses. Whereas I know person with nothing of these making huge profits everyday. She goes and buy stock and it would fly higher. When she sells stock would go down. I am beginning to believe in luck. You've established that success is not a result of knowledge. Nor of simply working hard. Correct. But don't assume it's a result of luck. Rather, success is a result of an effective growth and development plan. If you're not growing, then the problem is that your review processes are not driving any growth. Fix your review processes. We've covered this topic several times over the last couple of years but I continue to see evidence that more work is required. Let's examine my response in a little more detail. First, my writing was "lazy" in suggesting that success is not a result of knowledge. Nor of simply working hard. Of course, there is some level of knowledge required. And of effort. I simply made an assumption that the trader had reached adequate levels of both knowledge and effort. Perhaps this is wrong. I have no idea. They mentioned the stock market, but I have no insight into their strategy, their level knowledge, nor their levels of skill. However, regardless of this deficiency in my reply, the last part is the key. If you're not growing as a trader, then the problem is that your review processes are not driving any growth. Fix your review processes. Frustration for someone already possessing the necessary knowledge and effort, will typically be a result of deficiency in strategy, processes or skill. Regardless of the cause, an effective review process will make this clear. 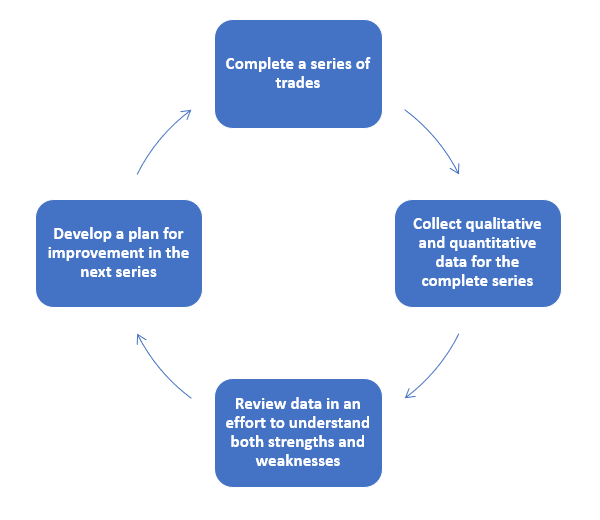 Ensure your trading process captures sufficient data to provide meaningful feedback. Ensure your review processes adequately assess this feedback in order to understand the cause of the current results and identify potential areas for growth. Growth requires an effective feedback loop. If you're not growing as a trader, then the problem is that your review processes are not driving any growth. 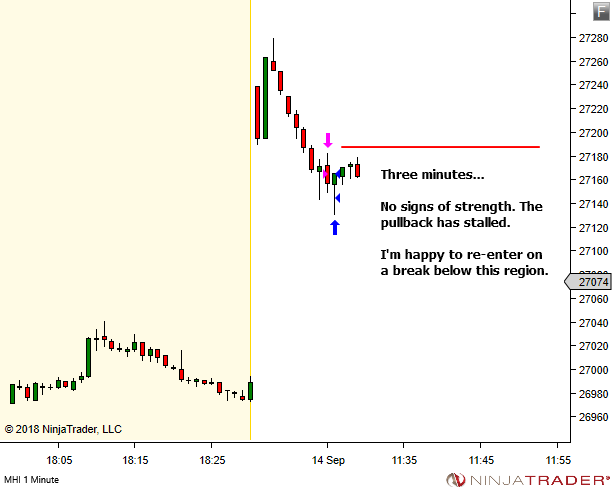 I receive a LOT of requests to review people's trades. 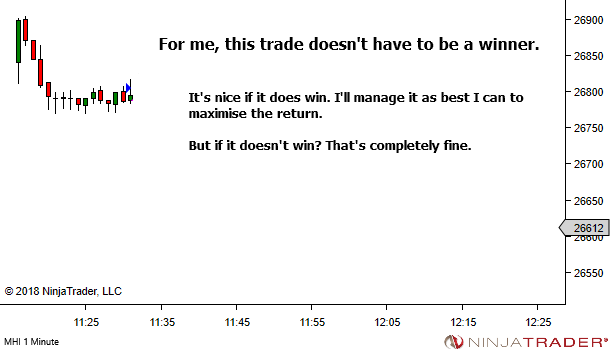 Rarely winning trades. Almost always a trade which either lost or was scratched at or near breakeven. "Was this a good trade?" "Was I right to take this trade?" "Should I have (entered earlier / entered later)?" Or any other variation of these type of questions. I get why. 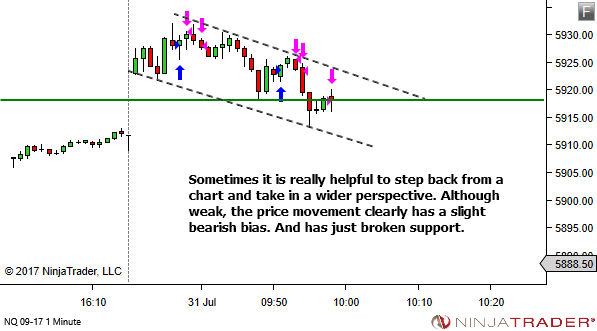 We're all trying to improve and so it makes sense to seek guidance from another trader. And I don't mind people sending them.It's really cool. I like looking over them. But I'm very hesitant to offer any real guidance, unless I can see something that is either ridiculously lacking in edge or completely reckless and irresponsible from a money management perspective. Not because I don't want to help. But because I recognise the danger of focusing on one individual trade – the fact that any advice I offer has just as much potential to damage their edge as it does to improve it. The thing is, I am COMPLETELY LACKING in some very important information. As discretionary traders, we are ALL unique in so many ways. 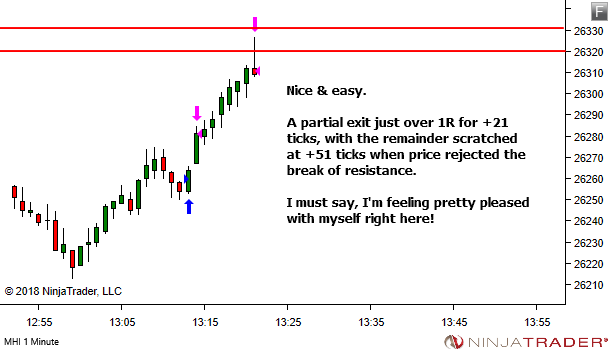 Even those who trade based upon my approach and the ideas I share through my site. No-one can become a perfect clone of me. And no-one should expect to. Those who I've seen have the most success are those who intentionally aim to blend some of my ideas and methods with their own. 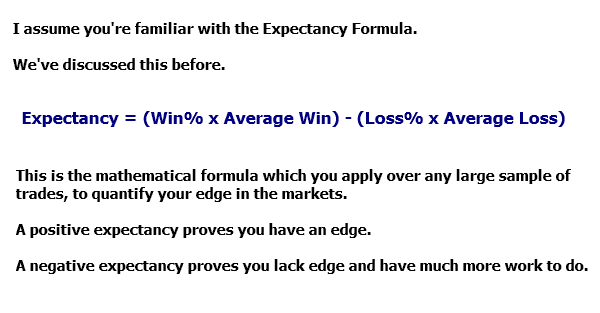 But even those who try to trade "exactly" like I do, I'm always blown away by the variation in how we read the markets and how we exploit edge within that "read". We all have our own preference for different types of trades. And different environments. The conditions that I find most favourable, might be the conditions in which you struggle the most. The conditions in which I underperform, and which I seek to avoid at all cost, might be the exact conditions that you excel in. If I try to force you into my view of the markets, based upon review of only ONE SINGLE TRADE, I might completely mess up your trading. Let's try a really simple example, so that this will hopefully make sense to you. 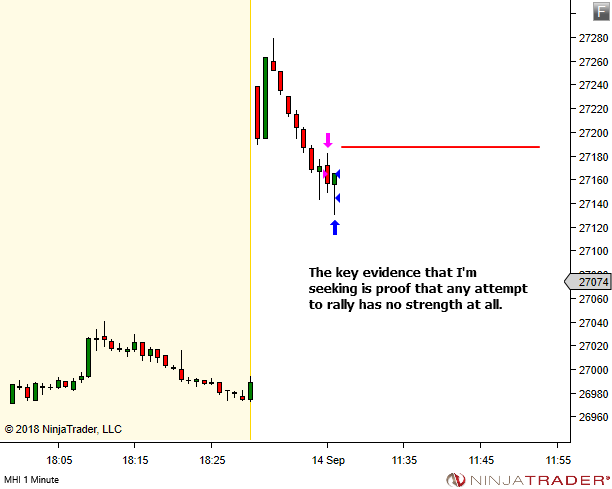 Let's say for example that I excel in with-trend setups. I feel the price flow really well. I'm in sync with the market. It feels fun. And kind of easy. 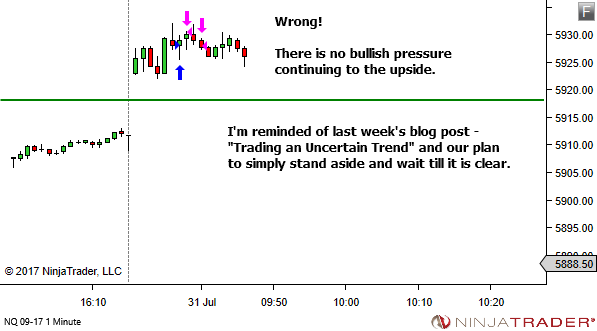 But at the same time, I tend to grossly underperform whenever I find myself trying to enter counter-trend. I don't read them well. I'm rarely in sync with price movement. It's not fun. And results show it's never easy. And then let's say you send through a trade. You guessed it – counter-trend. And of course, it lost. And you asked, "Lance, can you share your thoughts on this trade? Can you see where it went wrong and what I should do to improve?" Have a guess what my immediate thoughts will be. "Well there's the obvious problem. You're fading the trend. Hey, don't feel bad. Everyone seems to want to fade the market. But the odds are always better in the with-trend direction. 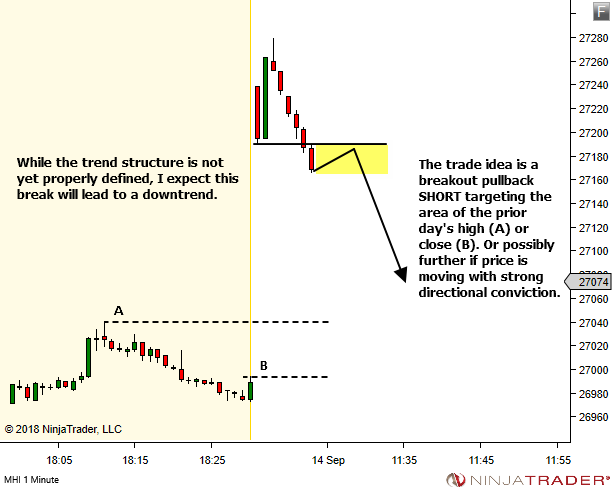 Why don't you try to restrict yourself to the with-trend direction instead." Ok, maybe this would help them. But maybe not. I don't know this person. I have no insight into their unique blend of knowledge, skill and attitude. I have no insight into their preferred style of trading. 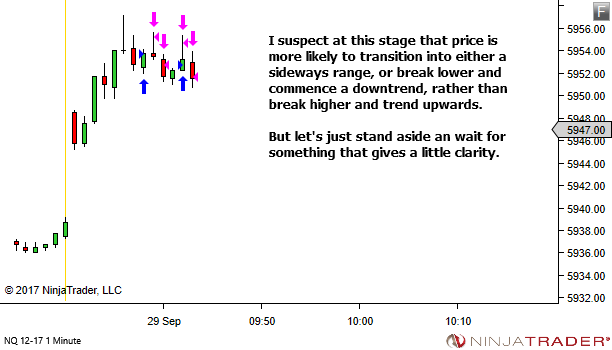 Or which market environment or conditions best suit them and their style of trading. 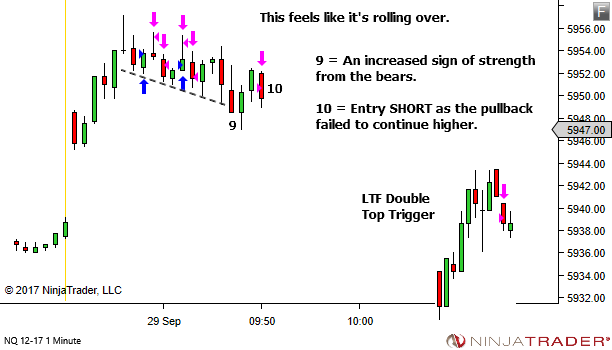 It might be that this trader naturally struggles to trade with-trend. 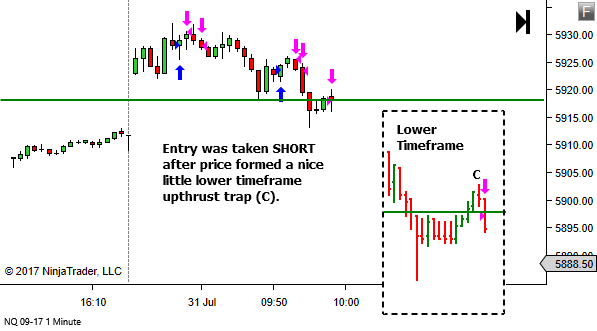 But they have some exceptional and natural skill at recognising exhaustion at the end of a price swing and timing a counter-trend entry for a fade back to the mean (and sometimes a complete reversal). Yes, this one trade lost. 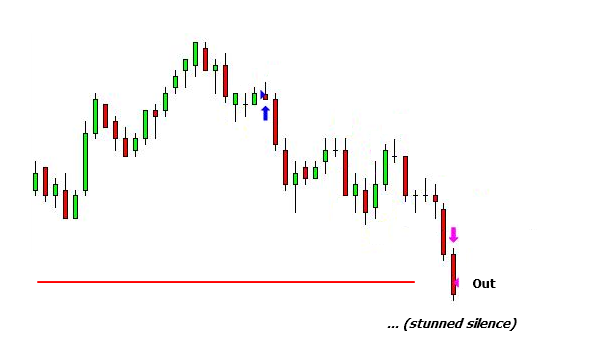 But what if any sample of 20 counter-trend trades from this trader's journal includes not only a number of losses just like this one, but also sufficient winners to not only cover the losses but also provide a nice positive expectancy outcome. Or (far more likely) if they're still developing and not quite profitable yet, sufficient potential to achieve those winners with only a small amount of further growth and development. 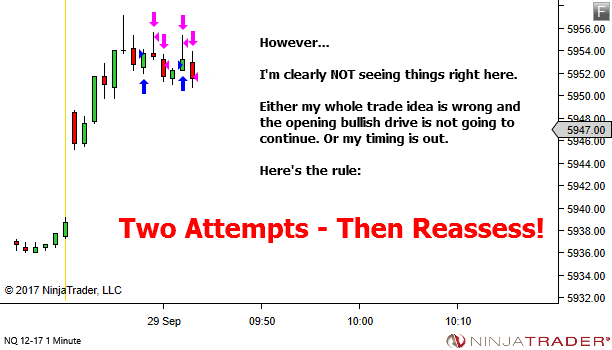 If I convince this trader to abandon their approach, or in fact vary it in any way that seems "obvious" to me from one single trade example, I could be setting them back months as I lead them blindly in the wrong direction. It doesn't matter if it's me you're asking for the review. Or any other trader. ONE TRADE is insufficient information for me, or any other trader, to provide you with any real value. I'm sure this opinion is unpopular. Clearly I expect many will disagree with me. Because you shouldn't need to send any single trades through to me. Or to any other educator or trading mentor. Let me share with you a better plan. 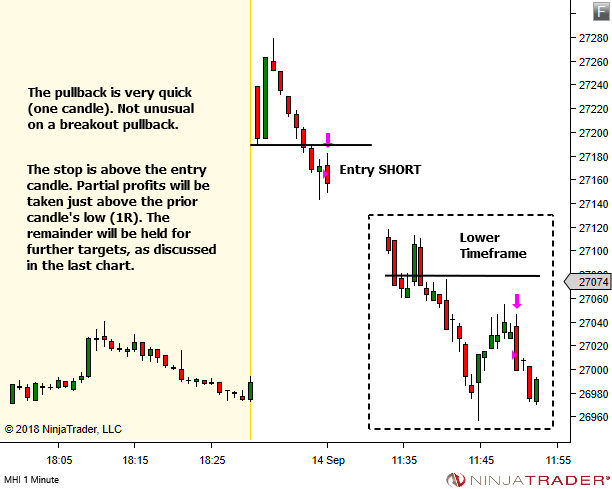 Let me share the response I sent out to a trader this week, who sent me a trade with a few questions about (a) the quality of the trade idea and (b) whether or not he'd be better skipping first entries and waiting instead for second-chance entries. I'm not picking on this guy. I actually quite like his trade. The entry at least. 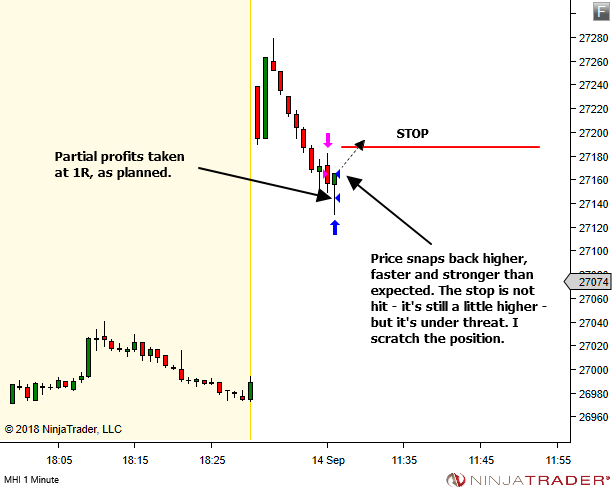 It didn't reach the target but his timing was good enough that the market offered enough movement and time to scratch the trade or take small profits. (He got out at breakeven so no harm done). I share this (with his permission) simply because I thought my response was important. I wanted to share it with all of you. This trader says he's coming along quite well. In his words, he's "finally starting to see how this might work". He's found a method that seems to fit his personality, but is still requiring improvement in some areas. 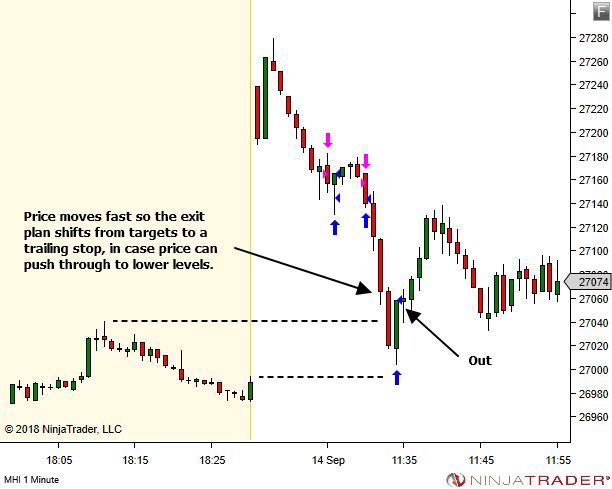 The following chart shows the trade sometime well after the entry. It was eventually scratched for breakeven. The notes have been added by me. These are difficult questions to answer. Let me explain why. What if I tell you not to take these trades because I don't like factors a, b & c. But what if also I don't see factors x, y & z, that you do see. It might be that you're good at picking these trades in which 6 out of 10 may fail, but 4 out of 10 may go on to give 5R winners. If I tell you not to take them, I could be destroying an edge that you have but which I just cannot see. Analysis of one trade is largely irrelevant. Look to stats for groups of trades. When you have group stats then you can look for what is working and what needs to be changed. Without that foundation I'm just poking around in the dark. I'm lacking context with regards to the desired outcome. So, my question to you is, based upon your 20 trade stats analysis, what part of your trading are you trying to improve? And why? Only then will analysis of this one trade make any sense. 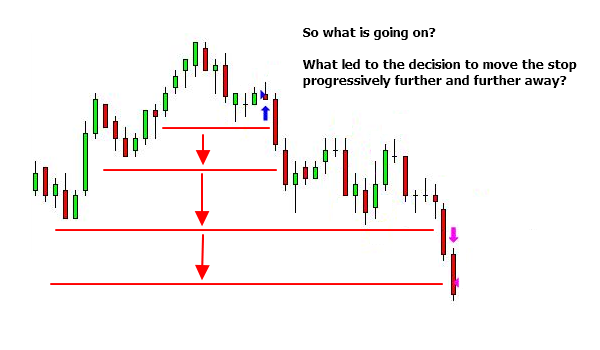 Get absolutely clear with how you want to trade the next group of trades. 20 minimum, but feel free to adjust that number higher if you prefer. I'll use 20 in the example. As much detail as you can – what type of trades are you taking? What are you trying to achieve in taking these trades? Now take 20 trades. 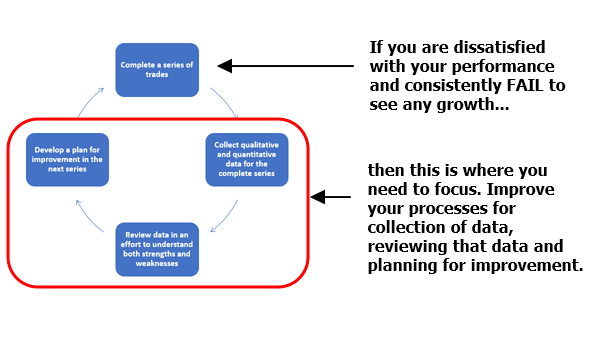 Your individual post-trade review is not important, beyond just confirming CONSISTENCY in sticking to your plan. By all means look deeper into each trade if you wish, but the priority is just to ensure that you're achieving some degree of consistency in your trade sample. Don't concern yourself with profit or loss (providing of course you're not breaking any risk or money management drawdown limits). On completing the full sample, analyse the statistics related to the full group of 20. 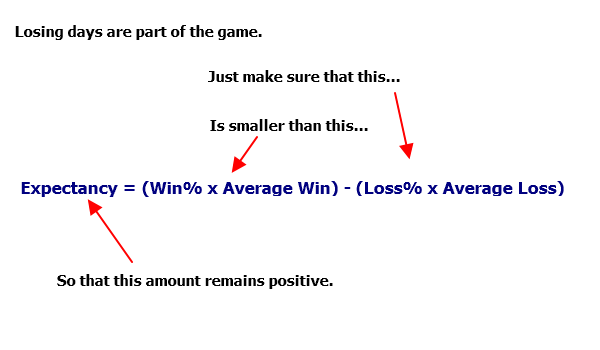 There are no shortage of stats, but the absolute minimum should be the Win% and the Win/Loss Size Ratio (WLSR) (or it's component parts being the Average Win and Average Loss). Find where you are underperforming. Which statistic is most in need of improvement. If you're underperforming in multiple areas, pick one for now. 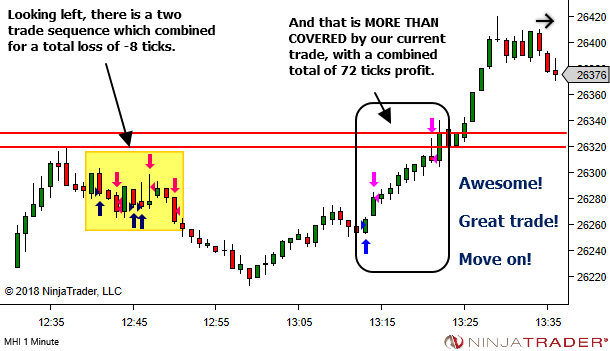 Dig into the individual trades and charts comprising your 20 trade sample to understand WHY they gave that statistical outcome. 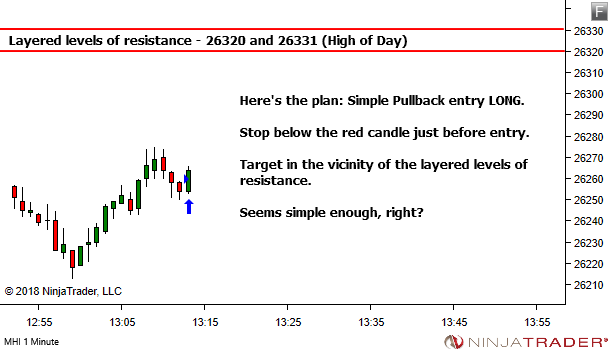 And WHAT you can do to improve that outcome in the next 20 trade sample. If you wish (and I highly recommend this) the same can be done for any area which really outperformed this time. Find out why and see if there is anything you can do which increases the likelihood of similar outperformance in future. 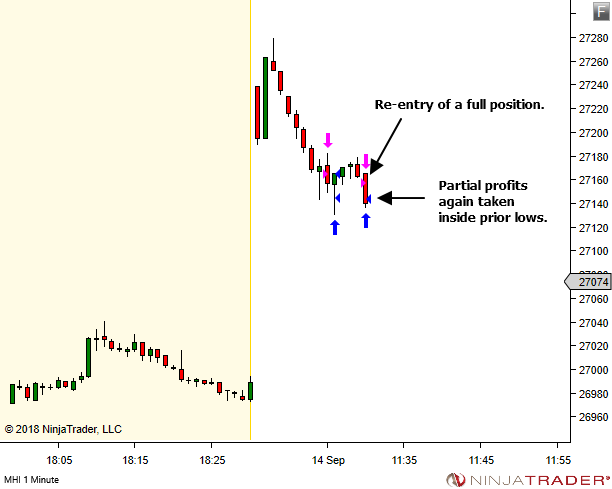 Most people just trade, review that trade, and then move on to the next trade and repeat the process. Progress is very difficult this way, as you get bogged down in individual trade problems, when they might not be an issue that impacts edge at all when considering a larger sample. Trade larger samples. Look to the stats. And use them to drive your trade review process and define the path forward. You don't need to ask my opinion. Anything I offer. based upon one single trade, risks being irrelevant or wrong when considering a larger sample of trades. Plus, you have all the necessary information. The group stats will identify the area that needs examining. And the charts and journal data will provide the information necessary to understand what happened, why and what needs to be done to improve. If stuck… sure… seek advice. But it's got to be based upon larger group stats analysis and not just ONE SINGLE individual trade. So take 20 trades and examine the stats. 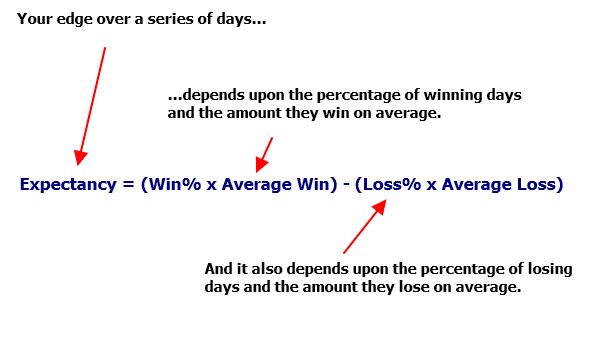 Find the underperforming statistic (Win%, Average Win or Average Loss). Look to the trade data to find out why it produced this outcome. And what can be done to improve. Now, having said this, let me just finish up with a few thoughts that do somewhat answer your questions. I do actually quite like your trade location and entry. I'd like to think I might have taken an entry there as well. 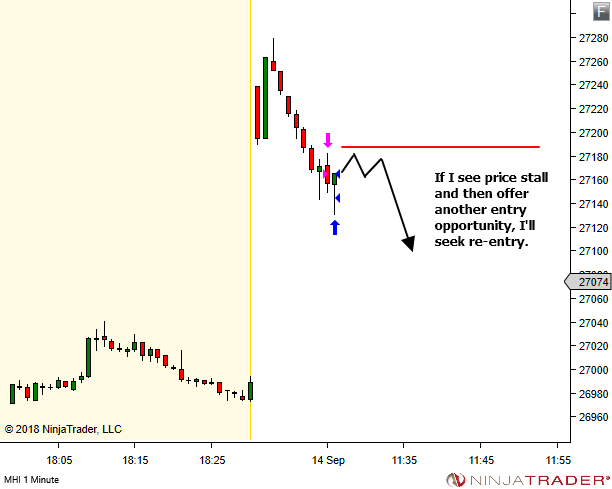 And yes, second chance entries are often a much better trade. 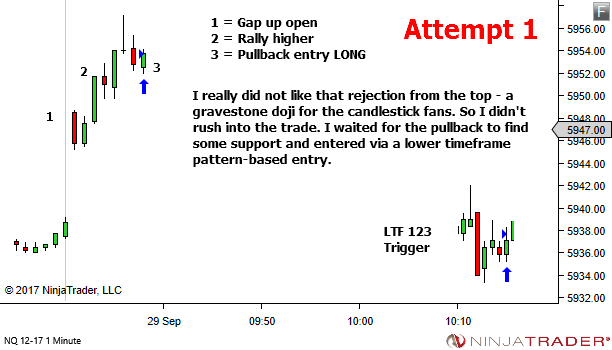 The problem with waiting for a second chance entry is that you miss a lot of good trades though, when the first entry might have worked. 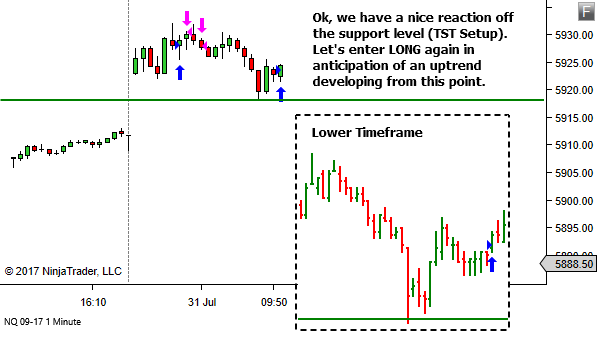 Hence my preference for scratching a first trade when I suspect it's not working, but watching closely for re-entry opportunity if there is another one set up. Maybe you could consider something similar. This does has it's own downside, in that sometimes I scratch and can't get back in. Ha ha. Nothing's ever easy in this game. 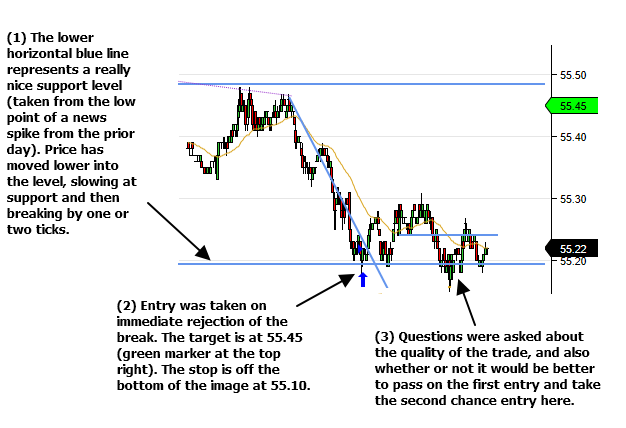 Summary: Again, I actually do quite like the trade idea and entry (original and second chance). But this is all irrelevant. Take 20 or more of these trades and look at the stats. Does it provide edge? If not, where do the stats suggest underperformance? Why? 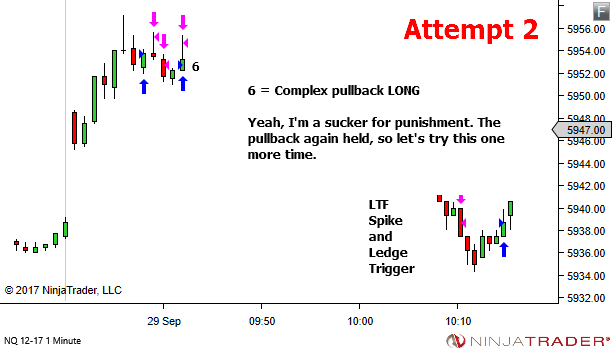 And then what can you do to improve the performance over the next 20 trades. The quicker you can recognise that you're wrong… the quicker you can become right. Two Attempts – Then Reassess! 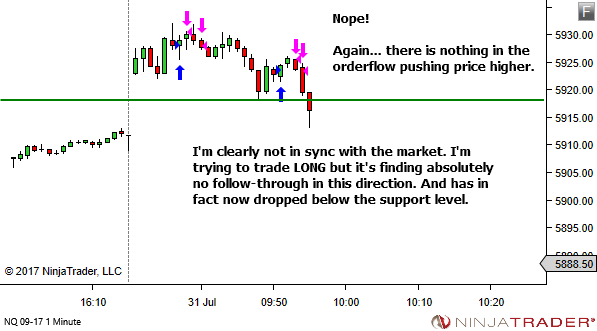 After two attempts at a trade idea, if it hasn’t worked, it’s clear that something is not right. You’re not in sync with the market. Your timing is out (which still means you're wrong). Confirm your position is flat. Step away from the charts. Then reassess from first principles. Try to see the picture from the perspective of someone who might have the opposite bias to you. What are they seeing? Could they be right? 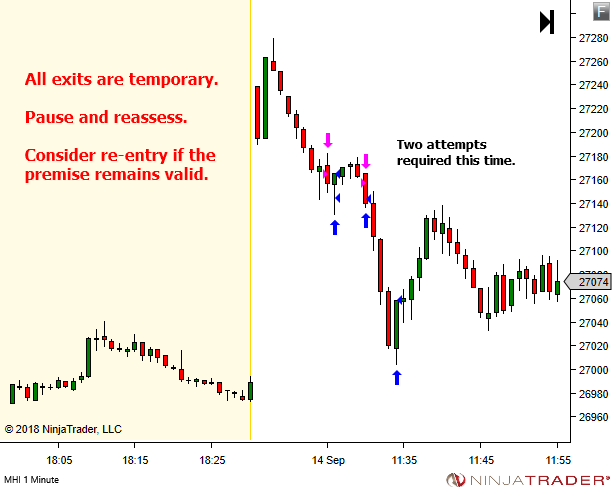 You may choose to get back in for a further trade (assuming session drawdown limits are not hit). But you may also have prevented a meltdown; stopping a good trade idea which didn’t work from turning into an absolute mess of a session. Learn to survive… and even occasionally profit… in the times when your read of the market is wrong. And that will leave you with confidence to attack the opportunity available at the times when you are in sync with the market. I sought out this old post in response to a similar sequence on Monday. One in which I was positioned wrong in the market. Not once, but twice. Before taking a step back from the charts and looking with a wider perspective and switching to the right side. 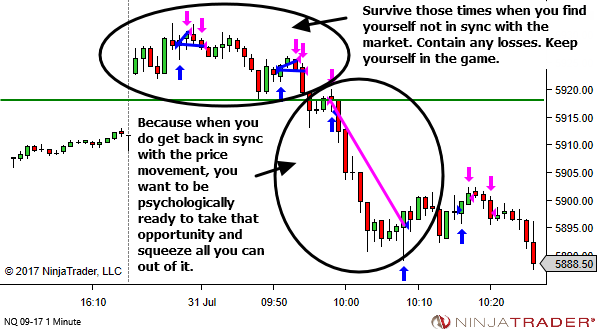 In email Q&A with a reader (Josh) during the week, he asked me the following question, "Do you feel like you're in sync with the market everyday?" The reality is that no, I'm not in sync with the market every day. There are many times when I've approached the market in a "less than ideal" mental or physical state and it has clearly influenced my ability to get in sync with price movement. And even when in an optimal state, there are many price sequences which are not simple to read. That's the nature of price movement – traps, retests, fakeouts. The market seems at times to take great delight in deceiving us. Managing those times when we're not in sync with the market to ensure we contain any loss and prevent it getting out of hand. Profiting of course, if possible, but our priority is to limit the downside and stay in the game. And then recognising when we are in sync with the market so that we can squeeze as much profit out of it as possible. Don't expect to always be in sync with the market. Sometimes you have to get it wrong a few times, before you can get it right.